Thank you for visiting our store! 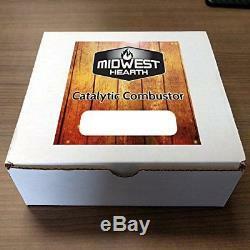 Midwest Hearth replacement combustors are a high-quality choice for your catalytic wood burning stove. 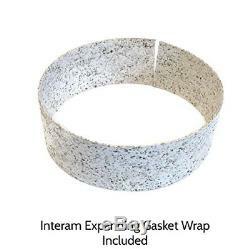 Includes interam expanding gasket wrap (2"wide x 18" long) that can be used if needed. Models FA 224, FA 264, FA 288. Federal Models (1992 and After). Models 28CC/28IC and 28JC (Before 1989). 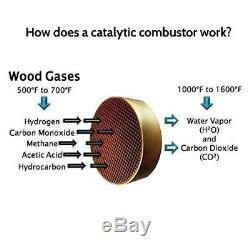 DECREASES POLLUTION - Midwest Hearth combustors remove 70% of harmful wood stove emissions, keeping the air clean and your family healthy. 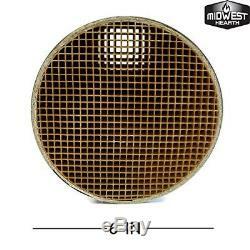 IMPROVED SAFETY - Catalytic combustors prevent the buildup of creosote, so there's a lower risk of house fires. Since 1990, the number of creosote-caused fires has decreased by 75% thanks to catalytic stoves. Product Dimensions: 6 x 6 x 2 inches. Item Weight: 1.8 pounds. 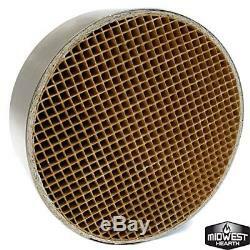 Midwest Hearth Wood Stove Catalytic Combustor Replacement Catalyst Dutchwest Englander (6" x 2" Round Ceramic). Please check the Voltage information and make sure it matches the one in your country. In case it's not stated in the description, do ask us. We guarantee that your issue will be solved quickly. We usually respond within 24 hours on weekdays. 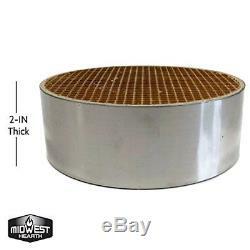 The item "Midwest Hearth Wood Stove Catalytic Combustor Replacement Catalyst Dutchwest Eng" is in sale since Tuesday, October 10, 2017. This item is in the category "Home & Garden\Home Improvement\Heating, Cooling & Air\Fireplaces & Stoves\Replacement Parts". The seller is "theeverythingstore0" and is located in Multiple Locations, USA. This item can be shipped to United States, Canada, United Kingdom, China, Mexico, Germany, Japan, Brazil, France, Australia, Denmark, Romania, Slovakia, Bulgaria, Czech republic, Finland, Hungary, Latvia, Lithuania, Malta, Estonia, Greece, Portugal, Cyprus, Slovenia, Sweden, South Korea, Indonesia, Taiwan, South africa, Thailand, Belgium, Hong Kong, Ireland, Netherlands, Poland, Spain, Italy, Austria, Israel, New Zealand, Philippines, Singapore, Switzerland, Norway, Saudi arabia, Ukraine, United arab emirates, Qatar, Kuwait, Bahrain, Croatia, Malaysia, Chile, Colombia, Costa rica, Dominican republic, Panama, Trinidad and tobago, Guatemala, El salvador, Honduras, Jamaica.